★ Rapidly increasing population, rising standards of living and exponential growth of industrialisation and urbanisation have exposed water resources, in general, and rivers, in particular, to various forms of degradation. The mighty Ganga is no exception. The deterioration in the water quality impacts the people immediately. Ganga, in some stretches, particularly during lean seasons has become unfit even for bathing. The threat of global climate change, the effect of glacial melt on Ganga flow and the impacts of infrastructural projects in the upper reaches of the river, raise issues that need a comprehensive response. ★ In the Ganga basin approximately 12,000 million litres per day (mld) sewage is generated, for which presently there is a treatment capacity of only around 4,000 mld. 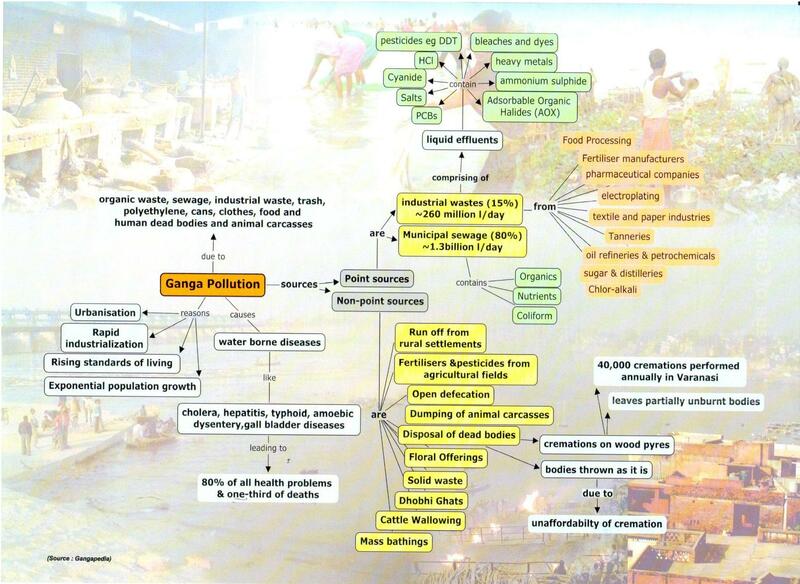 Approximately 3000 mld of sewage is discharged into the main stem of the river Ganga from the Class I & II towns located along the banks, against which treatment capacity of about 1000 mld has been created till date. The contribution of industrial pollution, volume-wise, is about 20 per cent but due to its toxic and non- biodegradable nature, this has much greater significance. The industrial pockets in the catchments of Ramganga and Kali rivers and in Kanpur city are significant sources of industrial pollution. The major contributors are tanneries in Kanpur, distilleries, paper mills and sugar mills in the Kosi, Ramganga and Kali river catchments.